Price corrections or not, condominiums in the Kuala Lumpur City Centre (KLCC) area still command the highest price compared with those in other parts of the country largely owing to its significant appreciation in the past five years. 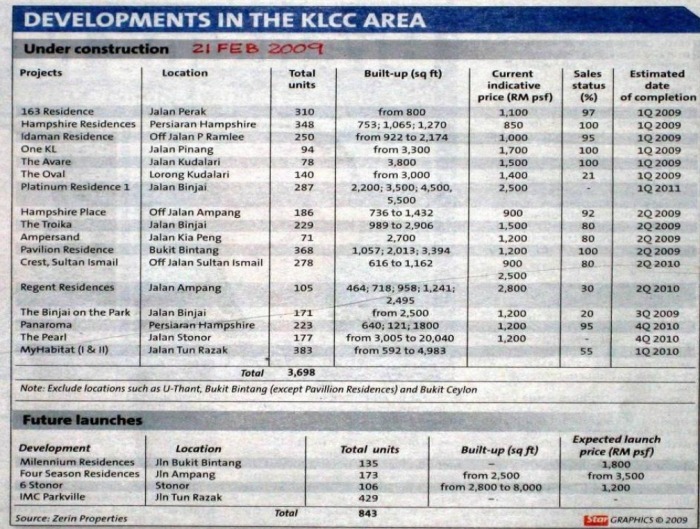 Prices of newly launched condos in the vicinity appreciated from RM500 per sq ft in 2004 to around RM1,000 per sq ft in 2006 and RM 2,000 in July 2008. And in August last year, prices peaked at just RM3,000 per sq ft following the soft launch of The Binjai on the Park by KLCC Property Holdings Bhd.